In our previous studies, all of the backtests were run with an even distribution of assets. This means if a portfolio of 5 cryptocurrencies was allocated, the selected allocation for each asset was 20%. During rebalances, each asset would be realigned to this allocation. In order to evaluate each allocation strategy, we performed backtests over historic data. This allows us to create a simulation of how well a strategy would have performed in the past. The following constraints were used when performing each backtest. Market data was collected from May 4, 2017 to May 3, 2018. This data was used to calculate the price of trades as they would have happened at that time. The trading path between each asset was performed by first trading to BTC. This simplifies the path across exchanges which may have different base pairs. Each trade was simulated using a .25% trading fee. Every portfolio in this study consists of exactly 10 randomly selected assets. After each backtest, a new random group of 10 assets is selected for the next backtest. This process is completed 1,000 times for each strategy type and rebalance period. The complete list of assets which were included in the study can be found in our backtest tool. At the start of each backtest, the portfolio is seeded with a $5,000 initial investment which is allocated across the assets. The rebalancing method used is outlined in our previous article. This distribution follows an allocation of 10 percent for each asset. Even distribution means that each asset holds the same weight in the portfolio. A portfolio of 10 assets would result in each asset holding exactly 10% weight in the portfolio. Whenever the portfolio is rebalanced, trades are made to realign the portfolio to match these desired allocations. These values represent the median portfolio value in USD, 1 year after an initial investment of $5,000. Each value corresponds to their respective histogram displayed above. Evenly distributed portfolios presented returns that ranged from a $40k median with HODL to a $123k median through rebalancing every hour. In addition to a higher median, rebalancing more frequently also presented a better spread. 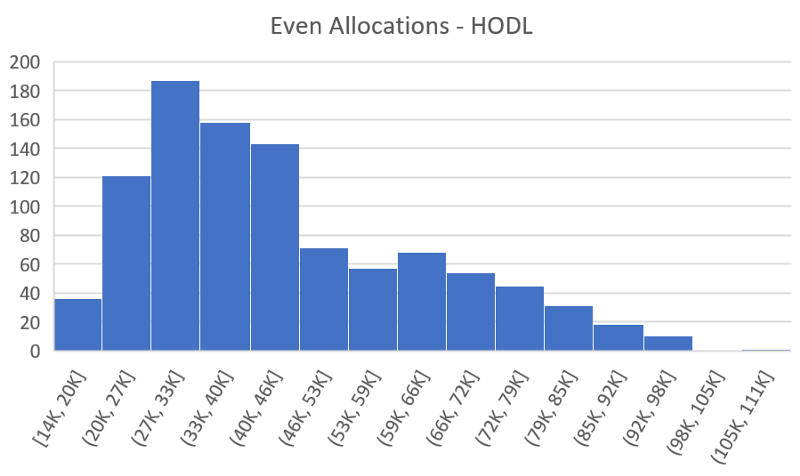 While the value of portfolios which used the HODL strategy were largely concentrated on the lower end, as observable in the above histograms, frequent rebalances improved the spread by distributing results over a wider range of values and higher performing portfolios. Not only did the median 1 hour rebalance period beat the median hodl, the worst performing portfolio out of over 1,000 backtests in the 1 hour rebalance strategy group beat the median HODL portfolio. After 1 year, evenly distributed portfolios which rebalanced hourly had a return of 2,360%. This distribution follows an allocation of 1, 3, 5, 7, 9, 11, 13, 15, 17, 19 percent for each asset. Linear distributions still have a total sum of percentages that equal 100%, but the weights for each asset is uneven. The method in which they are uneven is linear. Since linear can have numerous meanings, we defined a portfolio with 10 assets to have a linear distribution of 1, 3, 5, 7, 9, 11, 13, 15, 17, 19 percent per asset. Whenever the portfolio is rebalanced, trades are made to realign the portfolio to match these desired allocations. These are the median portfolio values for each set of backtests which are detailed in the histograms above. The results for a linear asset distribution presents a decline in returns over 1 year when compared to even distributions. The median values saw a decrease ranging from $2k for portfolios which used the HODL strategy, to $8k for portfolios which performed rebalances every 1 hour. We also see from the histograms that linear asset distributions decreased the spread of the results. Instead of a smooth curve, results aggregated at the lower end of this spread. This suggests that not only the median decreased, but there were also fewer high performing portfolios. After 1 year, linearly distributed portfolios which rebalanced hourly had a return of 2,200%. This distribution follows an allocation of 1, 1, 2, 2, 4, 6, 9, 15, 23, 37 percent for each asset. The final method of allocation distribution that we will discuss is the exponential distribution. This method simply allocates the assets in a way which results in one asset holding the lions share of the total portfolio value and each asset after that holds a fraction of the previous. We defined a portfolio with 10 assets to have a exponential distribution of 1, 1, 2, 2, 4, 6, 9, 15, 23, 37 percent per asset. Whenever the portfolio is rebalanced, trades are made to realign the portfolio to match these desired allocations. The first reaction you may have when looking at this distribution chart is that it looks like the allocations for a crypto index fund that tracks the top 10 assets by market cap. This is true. The major difference is that a top 10 index is based on current market caps, so the allocation for each asset shifts over time. Our study used fixed allocations across the one year time period. While this seems like a small distinction, it may be an important one. The results for an exponential asset distribution presented an even larger decline in returns over 1 year when compared to both even and linear distributions. The median values saw a decrease ranging from $3k for portfolios which used the HODL strategy, to $20k for portfolios which performed rebalances every 1 hour. We also see from the histograms that these backtests continued the trend of declining spread. The results are aggregated at the lower end of this spread, even more than the backtests which explored linear allocation distributions. This suggests both a decrease in median from the linear distribution, as well as a decrease in frequency of high earning portfolios. After 1 year, linearly distributed portfolios which rebalanced hourly had a return of 1,760%. Combining all of the results from this study, we can see how the median portfolio performed over the last year for each of these strategies and rebalance periods. These are the median portfolio values for each set of backtests combined across all histograms which were detailed above. Each value represents 1,000 backtests. With a starting portfolio value of $5,000, these median values represent the final value held by the portfolio after 1 year. This heat map indicates that even distributions with a 1 hour rebalance outperformed non-even distributions over the last year. In fact, the more uneven the distribution of funds, the worse the median portfolio performed. Disclaimer: Backtests examine past performance and do not guarantee future performance. The last year has proven that rebalancing a diverse portfolio can improve performance. Shrimpy simplifies the entire portfolio management and rebalancing process to a point and click interface. Quickly select assets, instantly allocate a diverse portfolio, and rebalance on a scheduled time period. Best of all, Shrimpy is completely free to use right now! If you still aren’t sure, try out the demo to see everything we have to offer! Leave a comment to let us know your experiences with Shrimpy! Feeling Left Out By The $250K+ Coinbase Index Fund?